Remember Fred MacMurray? I'm dating myself. He was the dad in My Three Sons, an old television series about a widower (MacMurray) raising three boys by himself with the help of his housekeeper, Uncle Charlie. Anyway, he was a very likable actor in his time and starred in a few Disney movies, including one filmed in Europe called Bon Voyage. The plot has the same premise as National Lampoon's European Vacation (which I suggested NOT to watch with your kids in a previous Movie Monday post) but is much cleaner. A typical midwestern family takes their three kids, including two teenagers, to vacation in France, and chaos, misunderstandings, and family quarrels ensue. 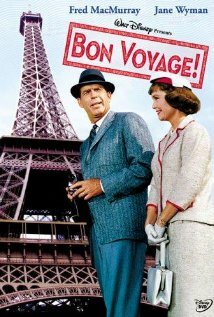 Bon Voyage was filmed in Paris and the Côte d'Azur in 1962, so it's kind of fun for adults to see the fads and fashions from that era, but your kids won't appreciate the nostalgia. It's highly possible they won't even appreciate this movie so much, since the humor is somewhat dated. If you're planning a trip to Paris with your family and think you might take a sewer tour, there is an interesting scene where MacMurray gets lost in the Paris sewers.